The Microsoft Surface Go is expected to ship to India from early October. Microsoft recently launched the Surface Go, a smaller and more affordable variant of the Surface Pro tablet. Shipping of the Surface Go has now begun worldwide at a starting price of $399 (Rs 27,500 approximately). Like the larger and more sophisticated Surface Pro devices, the Surface Go features an integrated kickstand at the back and comes with a regular version of Windows 10 pre-installed. The Microsoft Surface Go has been up for pre-order from July 10 in 21 worldwide markets, and now, shipping has begun across 25 of them. These markets include the US, Canada, UK, Ireland, France, Germany, Austria, Belgium, Luxembourg, Netherlands, Australia, New Zealand, Switzerland, Denmark, Finland, Norway, Sweden, Poland, Taiwan, Italy, Portugal, Spain, Malaysia, and Hong Kong. In the weeks ahead, the Surface Go tablet will also be available for purchase in Japan, Singapore, South Korea, and China. Pre-orders across Qatar, Saudi Arabia, UAE, Oman, Kuwait, and Bahrain are set to happen from September 12. The Surface Go is expected to ship to India from early October. Powering the new Surface Go is a 7th-generation Intel Pentium Gold 4415Y processor. According to a report by The Verge, the tablet will be available in two variants: 4GB of RAM with 64GB of eMMC storage and 8GB of RAM with 128GB of SSD-based storage. The latter, more premium variant of the Surface Go will sell at $549 (Rs 37,800 approximately). 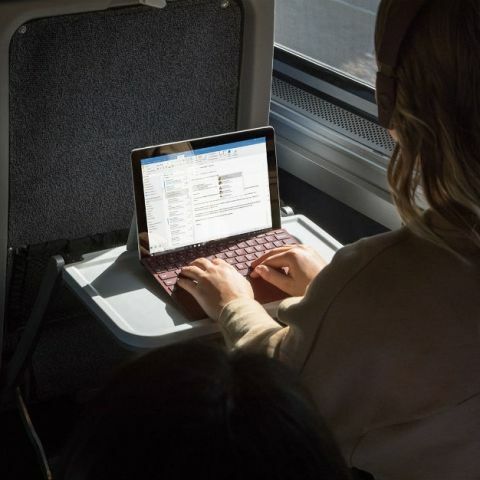 The Wi-Fi versions of the Surface Go will release first and be followed by the LTE versions later this year, said Panos Panay, Chief Product Officer at Microsoft. Like the older Surface Pro, the Surface Go will also sell with an optional keyboard cover and Surface Pen stylus. Each is expected to cost $99 (Rs 6,800 approximately). An optional mouse, apart from these two, will also be available at $34.99 (Rs 2,400 approximately). Given the device’s specs, prices seem relatively high even for a convertible laptop.